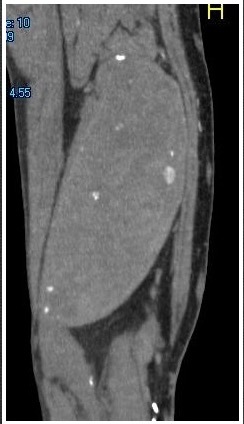 The femoro-popliteal aneurysm originally ruptured four years prior to surgery and I had bypassed it with a PTFE graft. For the trainees, I have to emphasize that these aneurysms rarely rupture, and are rarely found at these sizes. The patient had internal iliac aneurysms as well, and while no connective tissue disorder was ultimately diagnosed, he had suffered from prior inguinal hernias and was over 6 feet tall. In the intervening time, the aneurysm had steady growth from an endoleak. 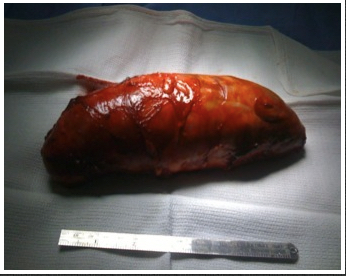 At the time of rupture, the size was indeterminate, but short followup recorded a size of 4cm. 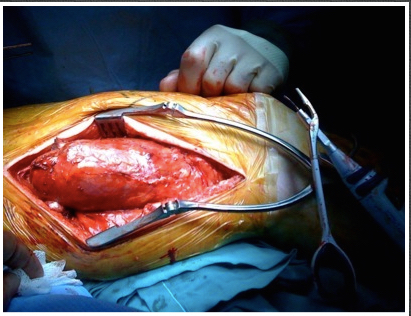 I had stapled off the proximal and distal femoropopliteal artery at the original surgery around the aneurysm. 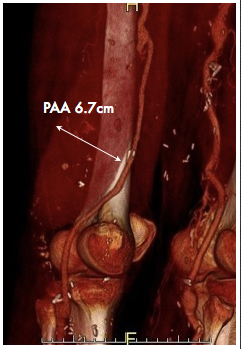 Over a 4 year period, during which the patient was briefly lost to follow up, the aneurysm regrew to over 6cm. At time of resection, there were several geniculate collaterals that were actively feeding the aneurysm. These were ligated.These would be the sources of the endoleak. In general, for larger aneurysms, simply ligating them prior to bypass may leave you susceptible to growth, and even after a rupture, an aneurysm like this can regrow to prodigious size from endoleak. Resection, partial or complete, at time of first repair addresses this potential problem, but was not possible at original operation due to blood loss and shock.